If you guys watch my Instagram story then you've probably noticed that I'm on a superfood oats kick. It's been my go to breakfast for the last two weeks of A Little Obsessed workouts for a few reasons. Oats themselves are loaded with antioxidants and I add wild blueberries and a variety of superfoods to up the health benefits even more. Oats are a great source of soluble fiber so they keep me feeling full through my morning workouts. Steel cut oats are the least processed of the oats and contain more protein than most grains...perfect for building strength and muscle. They're quick and easy to make and you can even prep the oats in bulk for your busiest mornings. 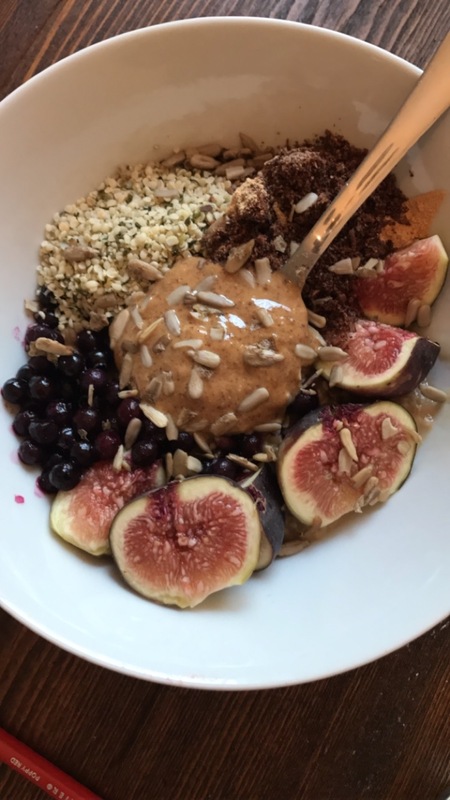 For me, the best thing about my morning oats is that there are dozens of easy ways to change up the flavor so I never get bored with them and I can still get a variety of nutrients from the same basic dish. 1 TBSP of cacao powder - more calcium than cow's milk, more antioxidants than blueberries and a great source of plant based iron, not to mention a natural mood elevator and anti-depressant. 2 TBSP of frozen wild blueberries - according to Anthony William, the Medical Medium, "There is not a cancer that wild blueberries cannot prevent, nor a disease known to humankind that wild blueberries do not protect you from." 1 tsp of raw sprouted sunflower seeds - promote cardiovascular health and healthy cholesterol levels, contain selenium which is a powerful antioxidants and great for thyroid support plus a great source of magnesium, which promotes a healthy mood. I've generally been rotating through some variation of these changing up my superfoods, nut butters and fruits. As you can imagine, the variations are countless. What's your favorite way to top your oats?